The TipTop Audio Stackcable is an American made cable with a genius design. Incorporating both a 3.5mm male jack and 3.5mm female socket in the plug of the cable, the Stackcable provides signal splitting directly from the plug itself. This gives you incredible flexibility to distribute signals without requiring the use of a multiple module. This new approach to synthesizer patching is also the world's first cable that combines this stacking design with ultra low-noise shielded performance. The Stackcable lets you focus on making music, and less on figuring out how to run multiple signals all over the place, and also provides more mult points and dynamic patching options. It achieves all of this without compromising precious rack space. The TipTop Audio Stackcable makes sure you consistently have jacks available, not matter how many connections are running to or from a jack socket. In normal circumstances with regular patch cables, once you have attached a cable to a particular socket, that socket is then blocked from other inputs. The TipTop Audio Stackcable does away with this limitation, giving you unlimited capabilities to connect your modules the way you want to and giving you a truly dynamic workflow. The Stackcables are the world's first cable that combines the Stackable banana cables with ultra low-noise shielded performance. The TipTop Audio Stackcable is patented, and is created from a heavy-gauge single conductor and signal shielding, resulting in low capacitance, low impedance, and unrivaled noise rejection. The Stackcable is a superior patch cable option, and ensures your studio remains quiet and maintains a clean signal for your modular rig. 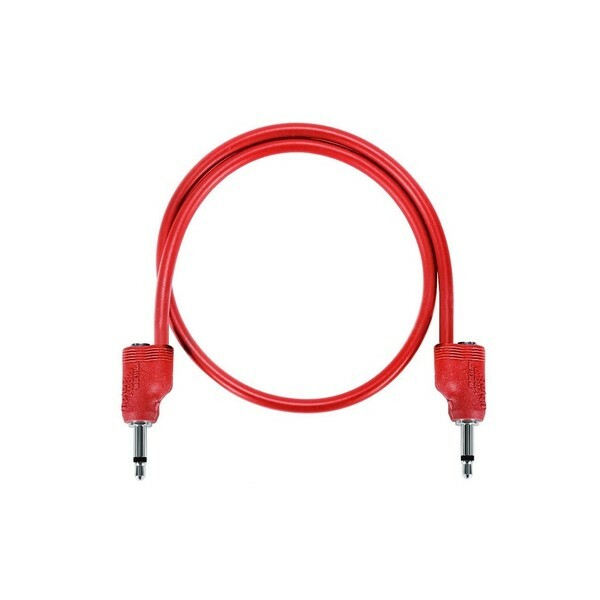 The TipTop Audio Stackcable features a unique patented plug design. Hiding a complex sub-miniature electro-mechanical design, the Stackcables rugged connectors combine a 3.5mm jack and 3.5mm plug in each end of every cable. These plugs handle both ground and hot signals, and ensures perfect connectivity for your setup.